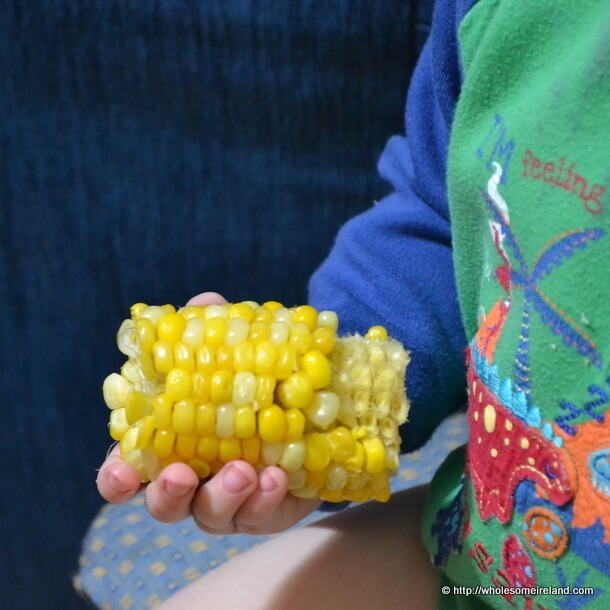 A sweet crop of golden sweetcorn has been harvested at the allotment and it’s pretty special. I also have some news! Little golden nuggets that pop in your mouth. There really is no better way to serve them than with a cold knob of proper Irish salted butter. It slips and slides down the hunks I made from the ears of corn. The ears were so big, I couldn’t find a pot to fit them in. That meant I hacked at them a bit to slot them into the large steaming basket. Not that we really minded. 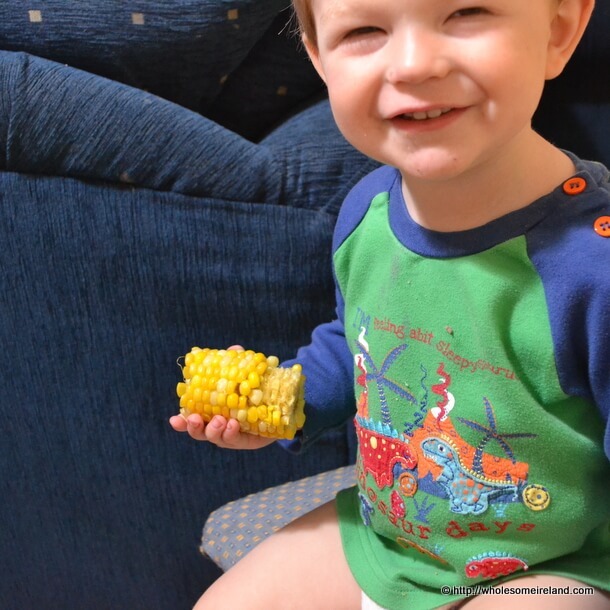 The toddler gripped the hunks in his chubby fingers and pulled the niblets one by one then ate them like sweets. You will excuse his dirty hands. He was playing with some beetroot earlier. I need to soak him in a few! 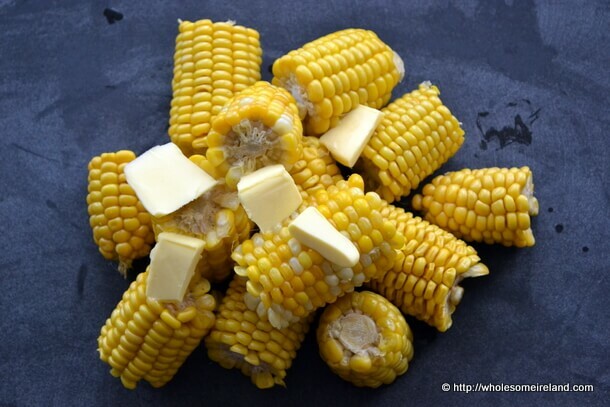 We ate ours like savages, butter running down our faces, pieces of sweetcorn stuck in our teeth, grinning at one another over our pot of gold. 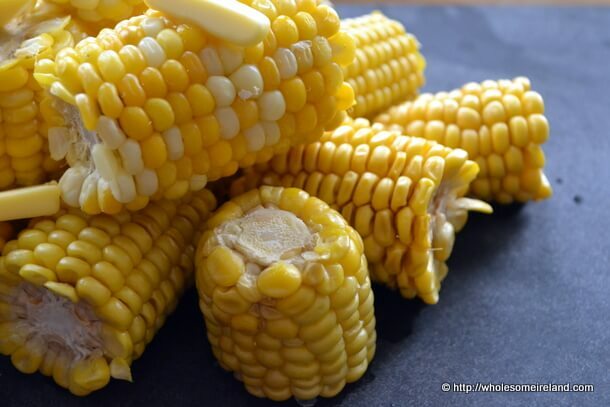 Wonderful, wonderful sweetcorn. Life is good. Speaking of the good life. Glenisk have invited me to give a demonstration on Saturday 17th August next at their Pop-Up store at 51 Dawson Street in Dublin. I’ll be demonstrating a few recipes and talking about how to feed your family well on a budget. The best part about this demonstration is that it is free to anybody who would like to attend. You’ll find more information about it here. If you’re interested in coming along, all you need to do is follow the instructions on the link to reserve yourself a place as they are limited. A little birdie has told me there may be some free goodies for attendees too. Right, I’m off to dust off my passport for the trip across to the Southside of the Liffey! Good Luck for the demo Caitriona! I would love to come and see you if I weren’t on holiday then!! Ah that’s a pity Edith it would have been lovely to see you again. Another time! First off Caitriona, your little one is completely adorable! It is nice to see your family has ended up with a wonderful corn crop this season. In my part of the world, the mid-west in the U.S., the end of August is corn harvest. I don’t know if this sounds good to you, but I thought I would pass the idea along and it could be tweeked to the tastes in your region. Like you, I enjoy developing recipes and saving money. A nearby specialty food store sold this item for 3.50USD in @ 1 cup size, so I came up with my own recipe. You can use this as a side dish or a vegetarian meal. Recipe uses: cooked orzo, fresh sweet corn (cooked), kale (heavy stems removed, cooked), butter, cream, parmesean cheese (grated), fresh lemon juice, kosher salt and pepper. I make a huge batch and freeze in portions, so there is no excuse to not eat something pretty healthy, since the butter and cream is used in such small amounts in the recipe. Thanks G. Allyn. Actually the sweetcorn is normally harvested around then too but we (whisper) grew ours in the polytunnel which is why it is ready now! That recipe sounds very interesting, I don’t have kale quite yet but I will certainly try it out in the Autumn. Thank you! I’m not going to be able to make your demo Caítríona 🙁 I’ll be away until the 20th. Really bummed to be missing it.